…Why should this woman be one heartbeat away from the Presidency? It’s a valid question, and one that many in Alaska are already asking. Including her mother-in-law. 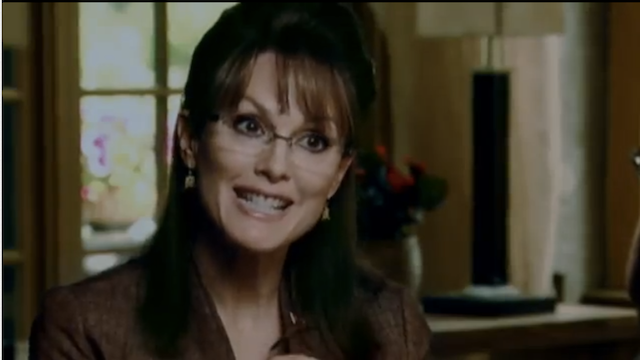 Faye Palin has confessed that she hasn’t decided how she’ll vote this November. “I’m not sure what she brings to the ticket other than she’s a woman and a conservative.” Clearly, this makes the get-out-the-vote effort for the McCain Campaign a little daunting if they don’t even have her family nailed down. The Daily News weighed in this weekend on Palin’s claim that she refused federal funding for the Gravina Island Bridge in Ketchikan, otherwise known as Senator Ted Stevens’ infamous “Bridge to Nowhere.” She said in her debut running mate speech on Friday, “I told Congress, thanks but no thanks on that bridge to nowhere.” Daily News writer Tom Kizzia countered, “But Palin was for the Bridge to Nowhere before she was against it,” noting that building the bridge was a central plank in her 2006 gubernatorial run. This was a bold choice for McCain, but as one pundit pointed out on CBS’ Face The Nation with Bob Schieffer this morning, “there’s a 40% chance” that she’ll say something monumentally-embarassing and possibly campaign-destroying between now and election day, leaving McCain wishing he would have picked Mitt or someone else instead. The early reports out of Alaska aren’t encouraging for the campaign. However, as Democratic strategist Bob Shrum pointed out this weekend on Air America’s Seven Days in America–and I rarely agree with anything that Bob Shrum says, given that he’s the Buffalo Bills of Presidential politics and can never win the Big One–the Democrats best dial down their rhetoric or they will underestimate Sarah Palin at their peril. If they set the bar too low and say that Joe Biden will destroy her in the VP debate, and she holds her own, then she and McCain win. Sage advice indeed from a man who has lost more Presidential campaigns than most of us will ever vote in. But this time he’s right. I will give John McCain credit in that his pick of Governor Palin has succeeded in owning the weekend news cycle. At least until Gustav. I won’t, however, go back on my earlier assessment that this is a retarded pick. He’s desperate. As a veteran of real battle stories and not just metaphors, he has to realize that he’s won the battle with Sarah Palin but he may well not win the war. But…meh. I’m a lonely voice in the wilderness. But I’ll likely be sharing a coach flight with Senator McCain sometime within the next seven months when there’s no chance he’ll be our next President. On the other hand, as far as the Obama campaign is concerned, maybe I should just keep my mouth closed. The only thing I’ve called correctly in the last seven months is his nomination, and, like much of the country, I had to wait months before that actually happened. Oh well. I’ll stick to my guns here anyway, and a number of the people of Alaska. This woman isn’t any more qualified to be Vice President than Giselda at the DMV, and more likely than any Vice Presidential nominee in the last century to accidentally become President, and a bad choice, and I’d make that call regardless of my party registration.